The GLIMMIX procedure displays in the "Model Information" table that the offset variable was computed with programming statements and the final assignment statement from your GLIMMIX statements (Output 44.3.1). There are two columns in the matrix, corresponding to the intercept and the regressor . There are 56 columns in the matrix, however, one for each observation in the data set (Output 44.3.1). The optimization involves only a single covariance parameter, the variance of the county effect (Output 44.3.2). Because this parameter is a variance, the GLIMMIX procedure imposes a lower boundary constraint; the solution for the variance is bounded by zero from below. Following the initial creation of pseudo-data and the fit of a linear mixed model, the procedure goes through five more updates of the pseudo-data, each associated with a separate optimization (Output 44.3.3). Although the objective function in each optimization is the negative of twice the restricted maximum likelihood for that pseudo-data, there is no guarantee that across the outer iterations the objective function decreases in subsequent optimizations. In this example, minus twice the residual maximum likelihood at convergence takes on its smallest value at the initial optimization and increases in subsequent optimizations. The "Solutions for Fixed Effects" table displays the estimates of and along with their standard errors and test statistics (Output 44.3.5). Because of the DDFM=NONE option in the MODEL statement, PROC GLIMMIX assumes that the degrees of freedom for the t tests of are infinite. The p-values correspond to probabilities under a standard normal distribution. The covariate measuring employment percentages in agriculture, fisheries, and forestry is significant. This covariate might be a surrogate for the exposure to sunlight, an important risk factor for lip cancer. 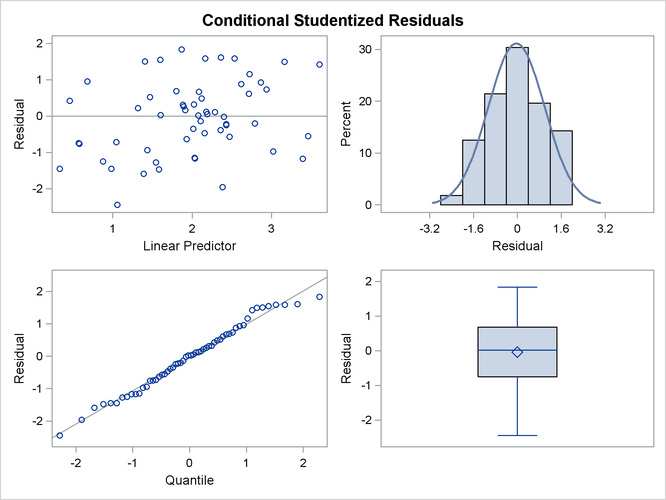 The graph in the upper-left corner of the panel displays studentized residuals plotted against the linear predictor (Output 44.3.6). The default of the GLIMMIX procedure is to use the estimated BLUPs in the construction of the residuals and to present them on the linear scale, which in this case is the logarithmic scale. You can change the type of the computed residual with the TYPE= suboptions of each paneled display. For example, the option PLOTS= STUDENTPANEL(TYPE=NOBLUP) would request a paneled display of the marginal residuals on the linear scale. 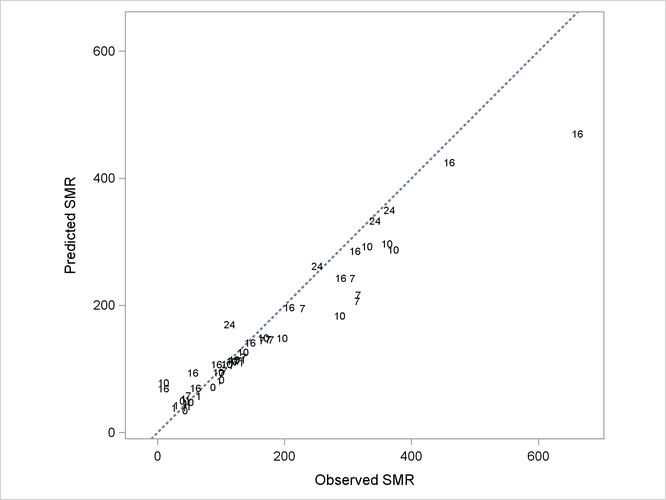 In Output 44.3.7, fitted SMRs tend to be larger than the observed SMRs for counties with small observed SMR and smaller than the observed SMRs for counties with high observed SMR. Because of the absence of random effects, the GLIMMIX procedure recognizes the model as a generalized linear model and fits it by maximum likelihood (Output 44.3.8). The variance matrix is diagonal because the observations are uncorrelated. The "Dimensions" table shows that there are no G-side random effects in this model and no R-side scale parameter either (Output 44.3.9). The estimates of and have changed from the previous analysis. In the GLMM, the estimates were and (Output 44.3.11). 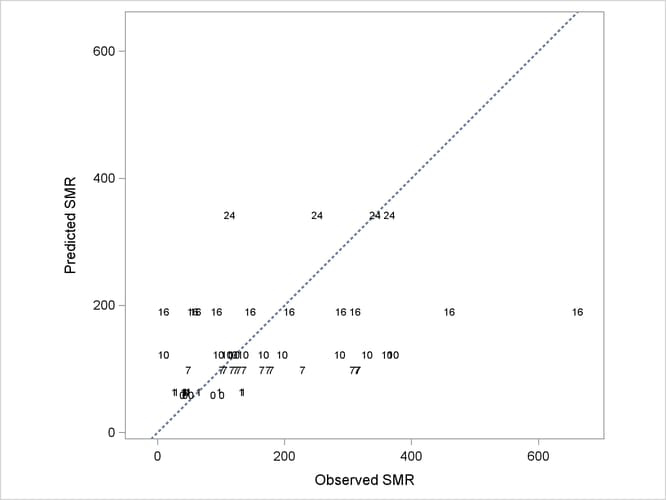 More importantly, without the county-specific adjustments through the best linear unbiased predictors of the random effects, the predicted SMRs are the same for all counties with the same percentage of employees in agriculture, fisheries, and forestry (Output 44.3.12).